Even though Dylath-Leen had released already albums in 2002 and 2008, I never heard of this French extreme metal band until 2011 when I saw them performing a great opening set for Arch Enemy at the Kulturfabrik in Esch. A good year later they are now back with their third longplayer Cabale. Focal point is undoubtedly vocalist/guitarist Kathy Coupez who not only looks great, but also utters incredible sounds. The idea that female metal vocalist have to sound like men is certainly now a new one, but the band’s implementation is successful nonetheless. But also the musical part is anything but negligible. Even though I referred to their style as extreme metal, their music is still incredibly varied. 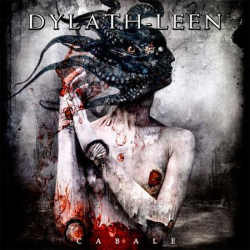 Dylath-Leen are certainly inspired party by metalcore, but unlike most bands of that genre, the French add even more tempo changes into the mix. Next to numerous brutal attacks, the band always finds time for atmospheric parts, dark elements and rhythmic breaks, before they insert either a playful intermezzo or an apocalyptic sonic inferno. Towards the end I even discovered some gothic influences, and especially Still, with six minutes the longest track on the album, surprises with clean vocals. The concluding Where The Vision Led is another highlight where the band creates a mysterious and threatening atmosphere reminding me of Voivod. All in all Cabale has turned out to be an excellent album which is never lacking suspense. Dylath-Leen have managed to stay extreme nonstop and still offer more than the same, old mishmash. The album has been thought through from the first to the last minute and is testimony to the band’s great musical talent.